Hi I'm Kami and I'm 12 years old. In Middle School we read a magazine article about you. I thought that it was amazing how you climb all 7 summits by age 18. You also amazed me by all your hard work and making it to your goal. You inspired me to try something new and try harder. My name is Hailey. I was stunned with what you did I thought it was fantastic because it shows that girls can do whatever they set their mind to and that we're strong. I was shocked that you did that. You showed me that I can do anything I want to in life. You showed me that you can set a goal of anything that you want to do you can achieve it. Even though it felt like a long time ago to you I was still stunned. Hi my name is Summer. I'm writing this letter because you inspired me by climbing mountains. The true thing that inspired me is that you finished your goal and didn't stop until you got to your goal. How do you reach your goal, so positive? I have a goal to become a lawyer. What do I do to accomplish that. It looked so easy when you accomplished your goal. I'll be waiting for your letter. Your story was amazing I can't believe you climbed all the seven summits including Mount Everest. I think your goal is a good one you should keep on climbing because you are good at it and you seem to like ti. Your story inspired me to become a NBA player and to play on the Lakers. My name is Morgan. I would like to thank you for really inspiring me to go after my goal. You helped me realize I shouldn't be so scared as I was you helped me A LOT. You must have had that goal for months!!!! You must have been kind of proud at the end. You also must have been kind of scared to be doing all that! My goal was to play soccer and do gymnastics and you helped me accomplish that and make my stage fright go away. Now I'm not really afraid anymore. So thank you for inspiring me to do those things you are my role model you rock! Thank you for your letters! I thought you all had some insightful comments and questions about setting goals, and I loved hearing about some of the goals that you have yourselves. I think it feels wonderful to have a big dream—something that you know is going to be hard, but motivates you to keep trying and pushing yourself. But, sometimes, big dreams can also feel intimidating. 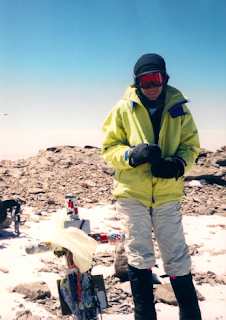 I remember when I was coming down from Aconcagua when I was thirteen, and my dad and I started scheming about the possibility of climbing the Seven Summits together. As we continued on, I started to get really excited about the idea. I started imagining what it would be like to climb all of those mountains—I felt motivated to do whatever I needed to in order to make it happen. But the idea also kind of gave me butterflies in my stomach. I didn’t even know what I would need to know in order to climb some of those peaks! It was exhilarating to think about, but at the same time hardly seemed possible. But a lot of you brought up the point that it’s important to keep setting goals, which made me think about how reaching a dream is really about the process. Breaking down your big goals into a bunch of smaller ones that you can achieve one by one is what makes those big dreams eventually possible. Instead of fixating on the summit, I think it’s better to keep your mind on just the next few steps. And to appreciate each and every one of them, even the hard ones. Because, in the end, I think enjoying the process is what makes having the dream worthwhile in the first place—dreams motivate you to get out there and actively do something that you enjoy. There are so many factors that can get in the way of making it to a summit—like bad weather, or altitude sickness. A lot of the time if and when you reach the dream is very much out of your control. But what always is within your own control is giving something your very best shot. And on the way back down I think that’s what feels most important, anyway.